I was finally able to wear the Witchery sweater I bought from Jamie-Lee back in July! It's so perfectly over-sized and comfy! Wearing it with these jeans probably wasn't the best idea for proportions, but I was in a 70s pants mood. Next time I'll wear it with super skinny jeans or a fun skirt! So many outfit ideas swimming around in my head. And yes, I was a geek and did a play on The Eagle's Witchy Woman for the title, told you they were one my favorite bands! Love that you finally got the sweater you've been wishing for, right off a bloggers back, haha. I'd love to see it with a skirt! I love that sweater! And you're so right that it would killer paired with some skinny jeans...maybe boots! Love this outfit, the flares look fab! An oversized sweater is something I am currently looking for - this one is perfect. 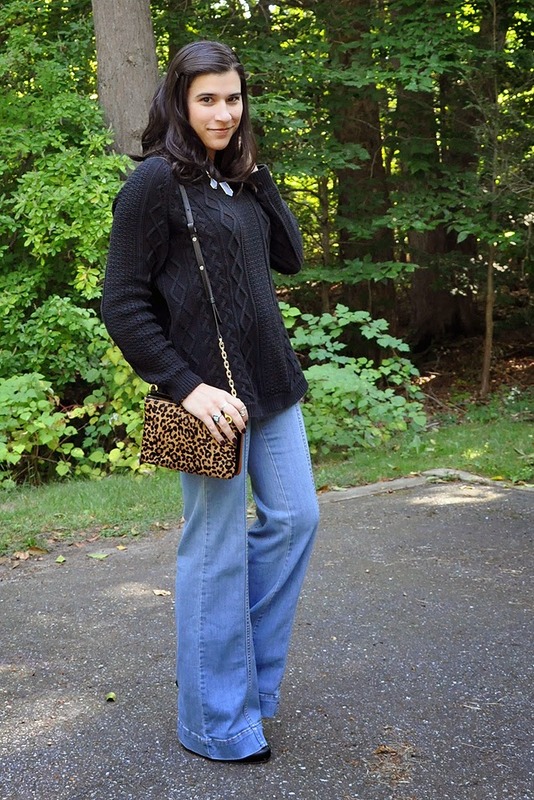 I love oversized sweaters, I really like the volume of the sweater mixed with the flared jeans, gives it a great vintage feel. That sweater looks so darn cozy! Add a cup of hot apple cider and you're set for fall. Such a sweet top and I love the necklace. oh the pants! I wish I have alike myself! I'm obsessing over that sweater. It's amazing!